Akina Mama wa Afrika is an organisation for Africa Women based in Uganda that champions for the empowerment of women socially, economically and politically. The organisation is led by Eunice Musiime- a lawyer and activist. 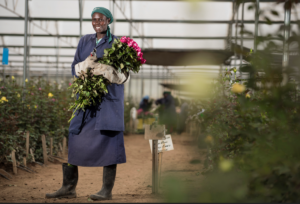 Akina Mama has worked with Hivos in the Women@Work campaign that works to change the labor conditions of women in the cut-flower industry. They have been particularly instrumental in leading women empowered for leadership component in the Hivos women@work campaign. Eunice has been in the forefront of fighting for the rights of women cut-flower pickers in the flower farms resulting to her rising through the ranks from a rose picker to a secretary general. Here are a some indepth details about the program. Akina Mama wa Afrika (AMwA) was founded in 1985 to create space for African women to organize autonomously, network with each other, share skills and expertise, identify issues of concern and speak for themselves. In 1997, AMwA launched the African Women’s Leadership Institute (AWLI) to spearhead training on feminist and transformational leadership across the continent. The AWLI has created safe spaces to introduce feminism to women leaders; to openly question their understanding of notions of women’s rights; and to acquire important leadership skills to create a new generation of African women leaders. What were the conditions for women like in the cut flower industry before you started your work? Despite being the majority of farm workers, women were underrepresented in leadership and decision-making in the horticulture sector both within the farms and trade unions. This lack of representation was due in part to women’s lack of confidence and skills to aspire for leadership positions. This therefore meant that a host of issues primarily affecting women were not prioritized as women were not strategically positioned to influence their outcome. Women were therefore subjected to hostile working conditions such struggling to juggle work obligations with breastfeeding; working long hours when pregnant, sexual harassment, exposure to toxic chemicals, and poor wages, among a long list of grievances. What are some of the achievements of your organization? AMwA has drawn upon her expertise and experience to empower African women with leadership skills to challenge patriarchal beliefs, norms and structures that impinge on women’s aspirations for growth through the development of a Women’s Leadership Strategy for the Women@Work campaign. The strategy looks to strengthen the leadership capacities of women workers at personal, association, national and international levels; promote gender responsive work place policies; strengthen the collective voice of women in trade unions for decision making; and to influence national, regional and international processes on gender equality and decent work for women in the horticultural sector. Thus far, a curriculum on “Gender and Leadership in the Horticulture Sector” has been developed. This is laudable because the one of the reasons for the absence of women in leadership positions a lack of resources to build the capacity of women to take up leadership positions. Furthermore, existing resources are not gender sensitive, and are modeled on positional and hierarchical examples that allow for the accumulation of power and the abuse of positions of responsibility. The curriculum modeled on feminist leadership aspires to be transformative as it contains tools that seek to dismantle oppressive and exploitative power structures, and that women leaders can use to participate in decision making and negotiate for holistic improvement working conditions in the horticulture sector. Further, AMwA has enhanced the leadership capacities of over 55 women and men from the horticultural sectors in Uganda, Kenya and Rwanda through Feminist and Transformation Leadership trainings. The trainings which were held in partnership with FEMNET and Rwanda Women’s Network were hinged on supporting women to overcome barriers to leadership, confront limiting attitudes towards women in the workplace, anchor gender diversity strategies to enable women to build their competence and seek leadership positions. Would you share about your partnership with Hivos? As part of the Women@Work campaign, Akina Mama wa Afrika partnered with Hivos, to develop the Women’s Leadership Strategy as a mechanism to promote gender diversity and address labour rights and other issues identified by a baseline study carried out by Hivos. The partnership is strengthened by both organizations interest in elevating the status of women and addressing structural challenges that prevent women workers from thriving in the work place. With support from Hivos, AMwA has so far held three trainings for workers in the horticulture sector in Eastern Africa. Which organizations have you partnered with in your work and how exactly how they helped? Is your Government involved in your efforts? Within the Women@Work campaign, AMwA’s core partners are the African Women’s Development and Communication Network-FEMNET, Rwanda Women’s Network, Uganda Horticulture Industrial Service Providers, Allied Workers Union (UHISPAWU), and Rwanda Workers Trade Union Confederation-CESTRAR. The partners have been critical in co-creating and testing of the Gender and Leadership in the Horticulture sector curriculum as they enriched it with their contextualized experiences. Further, they have been instrumental in the success of the feminist and transformational leadership trainings which they helped organize. Additionally, AMwA has worked with and the Association of Women Lawyers (FIDA-U) on advocacy for sa a case for the women workers who suffered from the effects of exposure to poisonous chemicals at one of the flower farms. Our work cannot succeed without the involvement of Government who is in charge of policy change, implementation and budget allocation. In this regard we work closely with the Ministry of Gender Labour and Social Development and the Ministry of Trade and Industry. We also work closely with relevant legislators such as the Workers’ Members of Parliament and the Uganda Women’s Parliamentary Association. At the regional and international level, we influence our Government to adopt progressive labour policies for women workers within the Gender Is My Agenda Campaign-GIMAC at the African Union, the African Commission for Human and People’s Rights to advocating for the implementation of the Maputo Protocol, and at the Commission of the Status of Women-CSW. What are some of the challenges that you face in your day to day operations? There are many challenges that impede the implementation of our work. Looking at the Women@Work Campaign specifically, one of the biggest challenges is institutionalized neo-liberal capitalism that thrives on the exploitation of desperate and poor workers. Since firms are invested in maximization of profits, they are hesitant to implement decent work policies and practices that will impact their bottom line. This problem is compounded by the cozy and often blurred relationship between Governments and Corporations such that Corporation and Government interests are one and the same. This makes it incredibly difficult to hold exploitative firms to account. Further, deeply-rooted structural obstacles such as the dominance of patriarchy exemplified by the unequal distribution of resources, power and wealth, combined with social institutions and norms that sustain inequality prevent African women from accessing power and improving on their situations. Lastly, a shrinking civic space brought about by repressive a State makes it difficult to organize and to challenge institutionalized injustices. AMwA’s strategic goal 2017-2019 is to contribute to improvements in the political, economic and social status of women in Africa by developing a critical mass of feminist leaders and activists effectively participating in leadership and decision-making and by advocating for the embedding of gender equality and women’s empowerment in policy and practice in global, regional and national frameworks and institutions. The Women’s Leadership Strategy specifically looks to strengthen the leadership capacities of women workers at personal, association, national and international levels; promote gender responsive work place policies; strengthen the collective voice of women in trade unions for decision making; and to influence national, regional and international processes on gender equality and decent work for women in the horticultural sector. What are some of the success stories that stand out to you so far? As part of our trainings, participants draw action plans to accelerate advocacy for decent conditions to guide the campaign for women’s leadership in the horticulture sector. The action plans have enabled the trainees to monitor the implementation of their advocacy plans. Since the training, participants have reported that there is increased confidence to handle worker’s disputes by trade union leaders, enhanced networking and movement building across the sector, and increased applicability of the laws and policies guiding worker’s rights. One of the female participants in Uganda, Maria Birabwa, went ahead to contest as a Women’s Representative at local council level using knowledge and skills she picked from the training. What methods do you use to empower women? Trainings, workshops? Etc? AMwA develops young feminist leaders by carrying out feminist and transformational leadership trainings. The leadership development is complemented by mentorship of the trainees for a period of one year, thus increasing the pool of feminist and confident leaders that respect and advocate for women’s rights. AMwA also engages in different policy and advocacy platforms at the national, regional and international levels to not only create room for stronger presence of African women in policy and decision making processes but also strengthen women’s voices for collective advocacy and movement building to influence policies and governance at the different levels of leadership. Using feminist lenses, AMwA carries out research on current and relevant thematic areas, to document and capture African women’s lived realities in the form of literature, pictures and videos; questioning the existing gender inequalities and systems of oppression. The knowledge generated is then applied to inform the transformational leadership training, policy advocacy and movement building initiatives. What’s your final word especially to potential beneficiaries who would like to reach out to you? Potential beneficiaries should know that AMwA is an inclusive organization that deliberately courts all African women in all their diversities regardless of religion, class, ethnicity and sexual orientation, among other things. This therefore means that women of all stripes are welcome to work with AMwA. Since the work of tackling discrimination and poor work conditions within the industry is an immense task, the collective efforts of everyone is required, no matter how small the contribution. Twenty years in supporting women, what are those enabling factors that can make women succeed in the African context? A number of new frameworks have been established for addressing gender equality and women’s empowerment at regional and global levels. The 2030 Agenda for Sustainable Development adopted in September 2015 forms the new global development framework anchored around 17 sustainable development goals (SDGs) with a total of 169 targets covering economic, social development and environmental protection and a call for women’s empowerment as a pre-requisite to the attainment of the goals. Goal 5 is dedicated to achievement of gender equality and women’s empowerment and also many targets within the various goals acknowledge the equality of women as an objective as well as a solution. Additionally, even though Africa has had only three women Heads of State so far, their attainment of these positions has raised much awareness among young women who see themselves as possible leaders in the future. This proliferation of women leaders has largely been because of the adoption of affirmative action policies that have placed a quota on the inclusion of women in many institutions. For example, Rwanda is by far the best performer with 64 women (to 36 men) in parliament, helped by a law stipulating that 30% of all parliamentary seats be held by women.